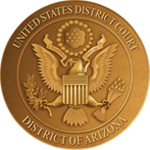 ECF users in the District of Arizona have the capability to search for filing events. The Event and Menu Search utility, labeled Search, is available from the main blue menu bar. When clicked, a small pop-up window appears, and the user can enter text for searching. Once the user enters text in the search box and clicks the Search button (or Enter on the keyboard) the results are displayed on the screen, with the search string characters highlighted. Each item is a hyperlink to the corresponding menu item or event, so the user can access the menu item or event directly from the search results screen. The search function ignores the order of the words entered for searching. For example, search for “amended notice of appeal” will find event Notice of Appeal - Amended. In general, the less text entered in the search box, the more events and/or categories will display in the search results screen. Note: The Search functionality is available for ECF users only (not PACER users).